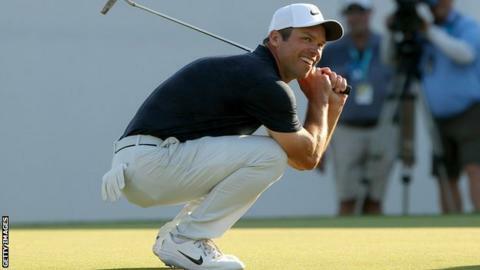 Paul Casey's gutsy victory in Tampa made it three wins in a row for European players on the PGA Tour for the first time in seven years. The timing could not be better with the Masters just around the corner. But Casey and his fellow recent victors, Rory McIlroy and Francesco Molinari, know their Floridian successes bring no guarantees of a repeat in Georgia next month. All that can be said is that this trio, who shared in Europe's Ryder Cup victory in France last year, should not be lacking confidence when they arrive at Augusta in a fortnight. And currently such sentiments cannot be expressed about many of their leading American rivals, of whom only Dustin Johnson has found genuinely consistent form this year. Make no mistake, the countdown to the first men's major is quickening, with only one more stroke play event - the Texas Open in San Antonio - before The Masters begins on 11 April. This week the world's best golfers contest the WGC Match Play in Austin. The vagaries of head-to-head combat, even when players are guaranteed a minimum of three group matches, provide a different dynamic. So Casey is right to revel in the strokeplay impetus he has gained from what he readily admitted was a somewhat scrappy but, crucially, successful title defence at the Valspar Championship. "Mega" was the way he described what that victory does for his Masters chances. He needs to be tidier on the greens at Augusta but maintaining his current standards off the tee would give him the opportunity to grab a first major title. A week earlier at The Players, McIlroy banished the demons of a string of near misses while last year's Open champion Molinari demonstrated he has not lost the winning knack with his triumph at Bay Hill in early March. Plenty of big-name Americans are yearning for such form. Only Johnson, who faded badly in a birdie-free final round at Copperhead, has been showing up well. With wins in Mexico and Saudi Arabia, the world number one has only two finishes outside the top 10 in eight starts this year. His frustrating closing 74 last Sunday was an anomaly and he was still sixth on a very demanding course. By contrast, nothing much has happened for the reigning US Open and PGA champion Brooks Koepka. Currently third in the world rankings, his runner-up finish at the Honda Classic and ninth in Abu Dhabi are his only top 20s in 2019. Justin Thomas began the year with three top threes but has had mediocre results of late, including 35th at the recent Players Championship. Bryson DeChambeau's fine form on the European Tour, which brought emphatic victory at the Dubai Desert Classic, has not been replicated on home soil where 15th in Los Angeles has been his best showing. Xander Schauffele missed the cut at The Players and has not contended since winning January's Tournament of Champions, while a share of 10th in Mexico is Tiger Woods' best return of the year. Masters champion Patrick Reed is yet to post a top 10 finish in 2019 and two more Augusta specialists, Phil Mickelson and Jordan Spieth, are also searching for form. Mickelson, who beat Casey at Pebble Beach in early February, has missed his last two cuts, while Spieth is down to 30th in the world standings having failed to finish higher than 35th since early September. Golfing form can be a capricious character. It has the potential to return as quickly as it deserts and Casey, of all players, can attest to that. The 41-year-old Englishman has experienced many highs and lows in a career that should attract growing admiration for its longevity. "I'm getting older but I feel like I'm getting better," he noted in the wake of this third PGA Tour win. His first came back in 2009 at the Houston Open. That season he rose to a career-high third in the world rankings but within three years Casey was out of the top 120. It has been a long way back but he has been top 20 for the past four seasons. He is now 11th in the world, with every player above him significantly younger. This second Copperhead victory indicates he can post a win when his game is not as ruthlessly efficient as he might think it needs to be. That knowledge could free him when next in contention because he remains prone to final-day inhibition. Who knows, that next opportunity might come at Augusta? But despite the recent trend, we would be naive not to expect a significant American challenge for the Green Jacket. The last time Europe won three in a row on the PGA Tour was, like this one, during the Florida swing. McIlroy won the Honda Classic, Justin Rose prevailed at Doral and, like Casey, Luke Donald triumphed at Innisbrook. That was in 2012. Who won the Masters that year? Bubba Watson.